September has arrived once again, the month in which the assorted Arctic area and extent metrics (almost) always reach their respective annual minima. Now we can start to speculate about what the assorted minima will be, and on what date. 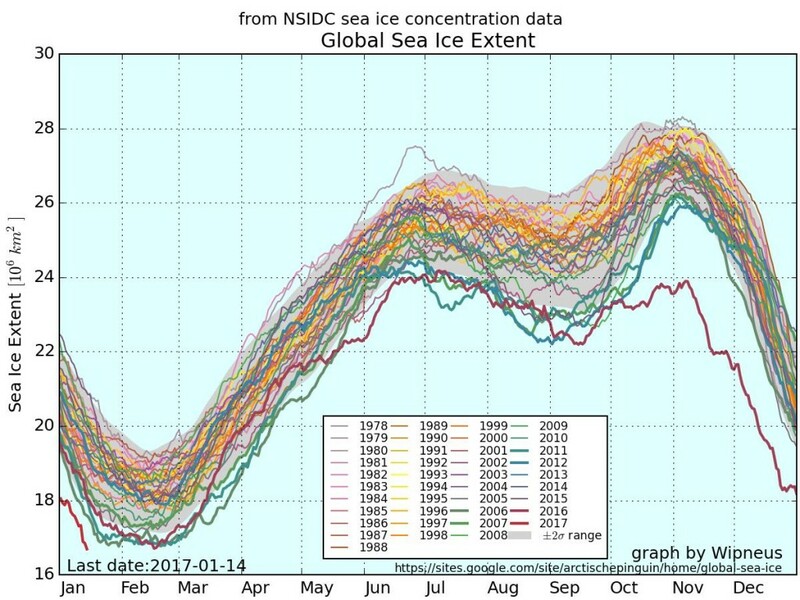 As you can see, global sea ice extent has just reached the lowest ever level in the National Snow and Ice Data Center’s satellite records going back to 1979. It was over a month later when the previous record was broken in February 2016, so there is plenty of time for the metric to fall further. Is the Northwest Passage Freezing or Melting? A reader writes to ask us to explain the answer to the above question in more detail. Are you sitting comfortably once again? Then let us begin. I wonder what the minimum for 2016 will be, and on what date? DMI continues to show rapid melting of Arctic sea ice.